I bought this ages ago on a recommendation and kind of forgot about it, so I started it last week without reading the blurb. This is the first ‘mythology’ based YA I’ve read – not sure if there’s loads of them around or not – and it was great. I loved the detail of the writing – the slow development of the character relationships; the dynamics added by the recycling of mythological characters and stories. It is good enough to keep you guessing what the mysteries are and how they will unfold. I think what I liked best about this was the depth of the world-building: the reflection of well-known myths and lesser known classic themes is woven so well into the world of the Scions and I think gave a wonderfully deep texture to the world the story is told in. Helen and Lucas are a lovely pairing – I felt they were quite realistic in their relationship – with all the obvious difficulties – I’ve definitely got a soft spot for Lucas and Hector (but then I always loved Hector in the Illiad). 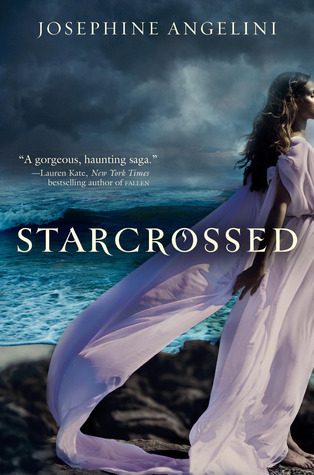 This entry was posted in Reviews and tagged Josephine Angelini, mythology, review, starcrossed, YA. Bookmark the permalink. ← Guest Post…Why is YA Fiction so Popular?